WHICH COMPANIES ARE LEASING SOUTH OF SAN AUGUSTINE? I have land near RT 147 and 103. Which oil/gas companies currently leasing land in those areas? Does anyone have contact information for them? Read the article in today's Financial Times. promises to us, but so far we have no results. we do, since we do not have the release. 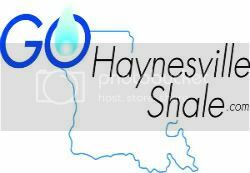 I am a novice with shale blog> Have a question...Are most of the Shale wells "good" wells? Also, about how long is the process, once the drilling begins...and is it bad luck to ask these questions? not going to stay on long . ANYONE seeing STATE OF THE UNION ADDRESS? A landman just left my house with the most ridiculous propasal to run a pipeline through my land. They are well below the industry average. They are not even offering half as much as other counties and parishs in the area. I hope the other land owners reject the proposal as well. about 20 or thirty years ago chevron drilled a deep well in that area. several of the majors were in on it. rumor was they went about 10,000 ft deep and hit on top of a massive salt dome and plugged and abandoned the well. does any body know any thing about this. I WONDER IF THIS MIGHT BE THE REASON FOR LACK OF INTEREST IN THIS AREA(T8N 11WEST. Does anyone else out there receiving or expecting to receive payments for NG taken from your wells think the gas companies are screwing up your division orders and second-year property usage payments on purpose to bank on the interest and keep money out of our pockets. Sec 32, T15N, R14W Any activity? Has anything been permitted or started in Sec. 32, T15N, R14W DeSoto? 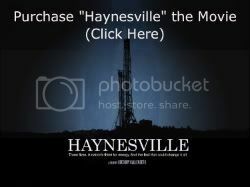 The Houston Chron is co-sponsoring a screening of "Haynesville" on Jan 21. The screening starts at 7 p.m., with an advance reception at 6 p.m. Afterward, Tom Fowler, the Chron's Energy Blogger will moderate a panel discussion with Kallenberg, energy industry observers and analysts." Forest Oil Corp. (FST) said it plans to increase its drilling activity this year after increasing liquidity with the sale of noncore assets in 2009. Shares were down 2.9% at $24.47 in recent trading amid profit-taking in commodity futures. The stock is up nearly 10% this month.